Keyword optimisation allows your website to be recognised by search engines for a particular field. This way you can beat your competitors to the top spot and provide your visitors with more relevant content. We delve into how to use keywords to increase your website ranking. 5 How often should you use keywords? The goal of keywords is to optimise the content on your website so that you can rank better within search engine results – and of course beat your competitors to the top spot. But this takes time and effort, which is why you should know how to use keywords effectively. In the past, people would simply write pages and pages of content and stuff keywords in there so that Google would pick up their pages and rank them well. But this no longer has any effect. Keyword stuffing is a thing of the past and properly optimising a webpage has become more challenging. You should be able to optimise a website for a specific keyword or phrase, without being obvious. That’s the difference when it comes to creating good quality content that ranks well. Keywords are very important when it comes to ranking well within Google. But you cannot simply create content and wait for Google to rank you at the top. You need to use the right keywords and optimize your website for them, and gradually build links to improve your rankings. It’s an ongoing effort. When it comes to using keywords, people often wonder where to use them, how to use variations of them, and how often to use them. Page title. This is often referred to as the title tag. The title is shown within search results and in your web browser. You need to add relevant keywords here. It’s a good idea to use keywords in a page’s URL. The format will look something like www.yoursite.com/this-is-your-keywords. You can use keywords without having to think about a catchy title. H1 tags. This is also the header of your page. It tells your visitors what your page is about, almost like a title of an article in a newspaper. This should grab a reader’s interest and be relevant to your content. Body copy. Here you should definitely use keywords. You can use variations of a main keyword, and remember to keep it natural. Mention your keyword in a natural way, don’t force it in the content. Image tags. This is html code used to add an image to a specific location or page within your website. Make sure you have relevant keywords as part of the image description. If your image doesn’t load for some reason, the text will be displayed. Meta descriptions. This refers to the text that is displayed within search results to explain what your content is about. Although search engines don’t use this to rank your website, they do highlight keywords within the results to make your website stand out. It’s often difficult to target multiple keywords on the same page, so it’s best to focus on one specific keyword or phrase per page. You can then use variations of that keyword within your page copy. A keyword variation refers to the keyword with one or two words added. For e.g. if your keyword is ‘garden supplies’ then variations could include ‘garden supplies in London’ or ‘cheap garden supplies’. How often should you use keywords? The title of your page is one of the most important parts to use your keyword in. Apart from that, use the keyword in your body content, H1 tag and your URL, if possible. You can also consider using it in your image tag, meta description and site navigation link text. If you don’t have a lot of places where you can use your content you should consider focusing on other strategies too, like building quality backlinks, to give you the edge you need over your competitors. Ranking well within search engines will require well-written content with optimal keyword placement. 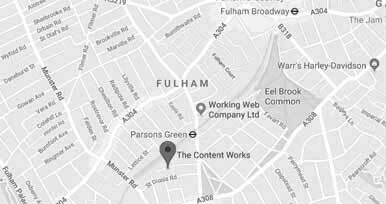 Speak to the experts at The Content Works to help you craft quality, relevant content that will help you rank well, and provide value for your readers.